Stephen F. Austin State University Assistant Professors Drs. Jim Ewing (left) and Mark Montgomery from the James I. Perkins College of Education's Department of Elementary Education will teach a two-year Advancing Inquiry in Middle Mathematics for Rural East Texas program. This free grant-funded program is for area teachers of fifth through 10th grade mathematics and can help them strengthen their current skills and learn new ones. NACOGDOCHES, Texas - A free grant-funded program for area teachers of fifth through 10th grade mathematics can help them strengthen their current skills and learn new ones. 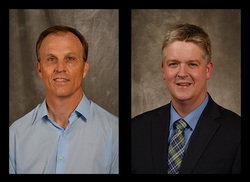 The two-year Advancing Inquiry in Middle Mathematics for Rural East Texas program will be taught by Stephen F. Austin State University Assistant Professors Drs. Jim Ewing and Mark Montgomery from the James I. Perkins College of Education's Department of Elementary Education. Ewing and Montgomery also served as co-principal investigators for the program, which is funded by an $865,963 Greater Texas Foundation grant. "This program is designed to support teachers through their own mathematical understanding, while also providing material that can be used with their students," Montgomery said. This new offering is a collaboration among SFA, the University of Texas at Tyler and Sam Houston State University. The program is geared toward teachers working near each university and includes many rural districts. Approximately 100 teachers from rural and small-town schools will be selected to participate. They will begin training July 26. Training is a mix of online broadcasts, weekly in-person meetings, weekend sessions and school-day training. Participants may be eligible for continuing professional education credit, stipends and materials. "This is an excellent opportunity to participate in free professional development," Ewing said. "I will be offering advice on how to engage emergent bilinguals and students from poverty. We all have our areas of expertise, and the teachers benefit from our diversity." Likewise, Montgomery has experience working with middle-level teachers. "Working with teachers to expand their own knowledge and give them resources to expand their students' knowledge is why I am excited to be a part of this project," Montgomery said. During the first year, participants will study algebra, geometry and numeration. In year two, teachers will receive training on how to use iPads to teach mathematics and add statistics to study topics. To register, or for more information, visit https://uttyler.az1.qualtrics.com/jfe/form/SV_daokPLRKvgZhN3L.